Police Brutality (or Misconduct) is a use of excessive force by a law enforcement agent. An experienced Michigan police brutality attorney can protect and defend your rights against this form of injustice. While many people feel even an appropriate amount of force as excessive, it is sometimes a necessity for the safety of the police officer, bystanders, or even the offender themselves. However, cases have developed where law enforcement officers have abused their authoritative power and mistreated citizens. Police are employed to keep society from chaos. However, sometimes law enforcement may develop a sense of authority over the rest of society, leaving some with a sense of entitlement or power. This detachment can cause them to feel alienated and to ignore the laws and regulations the rest of us must abide by. You have certain actions available when you suspect injury due to a case of police brutality in Michigan. 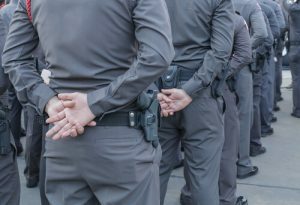 Taking the right steps can help your Michigan police brutality lawyer present a clear case as to why an officer’s behavior could have caused more harm than was necessary. In opposition to popular belief, the rise in police brutality rates is not due to an increase in incidents, but rather an increase in availability of video cameras and camera phones. This documentation can take a ‘he said / she said’ incident into the courts for some actual contemplation. These videos are compared to a Use of Force Continuum which sets the levels of force considered appropriate to the subject’s behavior. Having recorded evidence of officer misconduct does not immediately mean the court process will end with a ruling in your favor. A Michigan police brutality lawyer can present the evidence and argue on your behalf, presenting why your rights have been violated at the time of an arrest, dialogue, or other confrontation with law enforcement. If you feel like you have experienced police brutality or misconduct, contact us for a free case evaluation today.